If you’re looking for a town that offers the best of worlds (conveniences of shopping, excellent restaurants, local flavors, music and outdoor adventures) Bend, Oregon would top our list. Situated in the heart of state the temperatures are generally warmer and the precipitation levels lower than it’s big brother, Portland. It manages to has a tenth of the traffic issues and retains it’s small town charm despite a population of 80,000+. It also happens to be home to several of our dearest friends who we’ve known since our sticks n’ bricks days. And, as you know, the best way to immerse yourself in the locals scene is to tag along with the locals. We’d visited Bend during the Sister’s Folk Festival prior to our start as fulltimers, hauling our little tent camper on an epic 2 week vacation from California’s Wine Country to Bend and then returning via the Oregon Coast. But we weren’t about to pass up another opportunity to attend the festival…especially when one of our friends helps put the whole thing together. 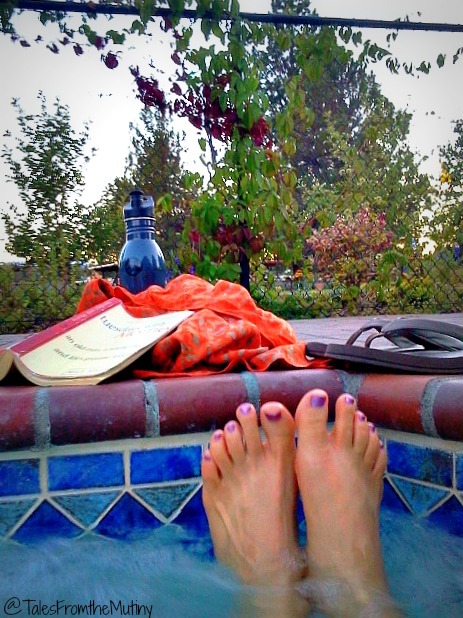 Taking full advantage of the hot tub at the park. 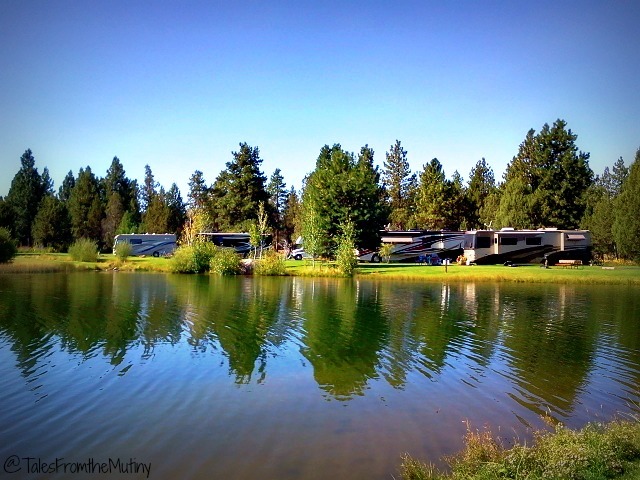 Due to our lack of planning (seems we got our festival tickets and then failed to make reservations during one of the busiest times of the year) we ended up paying the big bucks for a campsite at Bend/Sisters Garden RV Resort. Remember, this was prior to our solar install and the Mutiny didn’t have an inverter so dry camping wasn’t really a viable option. The city park, which offers dry camping and full hookups and has a much better proximity to the festival locations, was already booked solid. Aside from the price and some strict pet rules, Sister’s Garden Resort was a nice treat. The park is immaculate, nicely landscaped and offers a hot tub, pool, walking trails and par-course and dog areas. 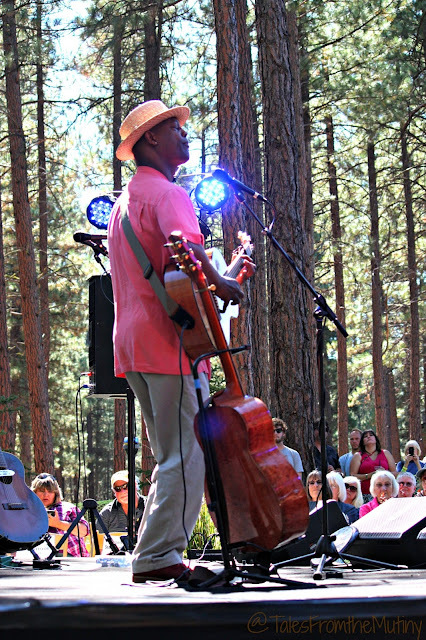 The amazing Eric Bibb…a highlight of the festival. The festival is held every September, the weekend after Labor Day. There are 10 stages scattered throughout the adorable town of Sisters which is nestled in the foothills of the Cascade Mountains and the Three Sisters Wilderness. The town of Sisters is home to boutique shops, local coffee roasters and distillers, farm to table restaurants and has a plethora of outdoor adventure access points (from hiking and mountain biking trails to kayaking, golf, skiing, fishing, etc.). What did we do? Basically listened to music, ate and drank. 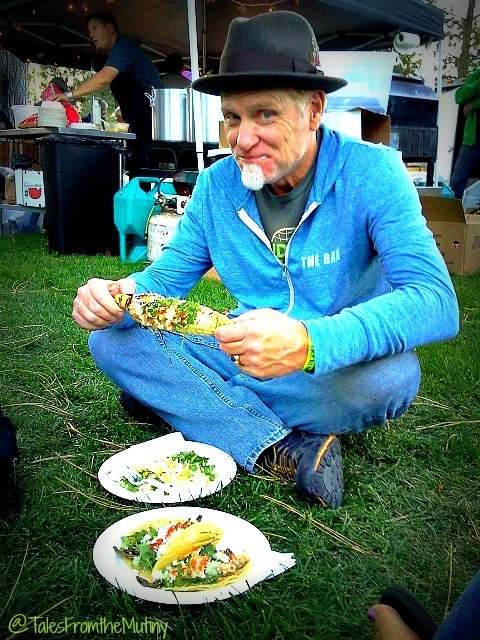 Hot roasted corn and vegan street tacos on the lawn outside of one of the festival tents. 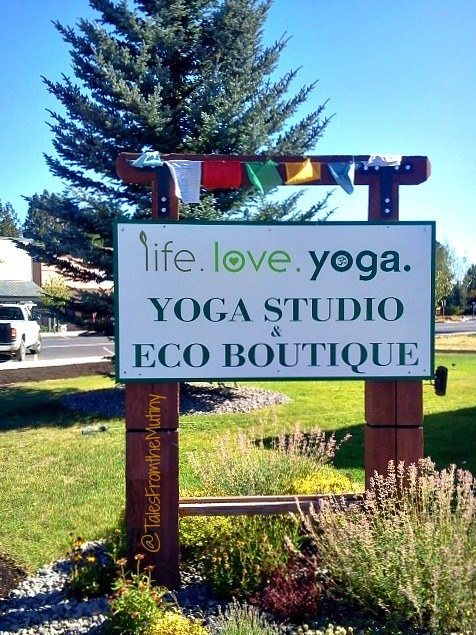 I did squeeze in two yoga classes…one in Sisters at Life.Love.Yoga and one in Bend at the Senior Rec Center (it’s not just for seniors). 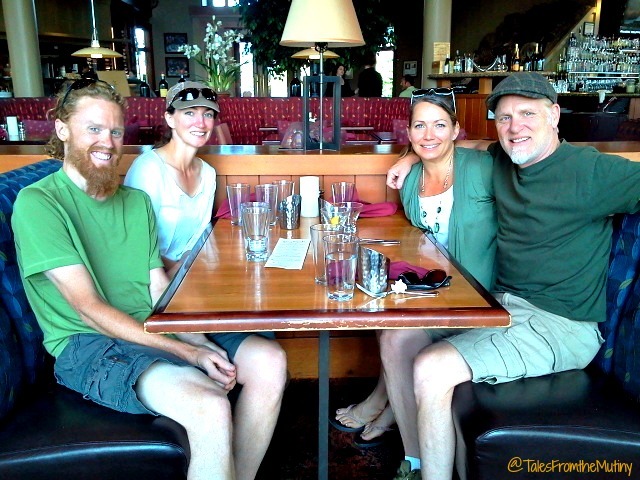 And, we finally got to meet Brent and Christine from Horton’s Travels. We’d been stalking them for a while and found out they were boondocked nearby. What started as a lunch date turned into 3-4 hours of chatting over beers at Greg’s Grill in the Old Mill District of Bend. McMenamins Old St. Francis School ~ Once a Catholic schoolhouse McMenamins is now a pub, restaurant, brewery, boutique hotel, bakery and theater. It’s quirky, it’s hip, it’s fun and it’s a great spot to hang out. Pilot Butte ~ For an easy, but uphill, hike (or drive) head over to Pilot Butte and take either the road or one of the three trail to the top. The views are spectacular and you’ll have earned (or walked off) a beer or two. Easy access and right in town. Hike the Trails ~ Bend Parks and Rec manages 65 miles of trails including the Deschutes River Trail and Shelvin Park. You can spend an amazing day walking along the river right in the Old Mill District. Or head out to one of the many trails in the local area. Bend Ale Trail ~ Well, this may come as a shocker but I (Lynn) don’t drink beer…I drink a lot of other stuff but beer has failed to please my palate so far and with so many other spirits available on the planet I see no reason why I should push it. And, although Clark does like to throw a few cold ones back every now and then, he’s never jumped on the IPA or “craft beer” bandwagon. He’s a bit old school…Coors Light or Stella will do just fine. However, Bend is well-known for having the largest beer trail in the U.S. 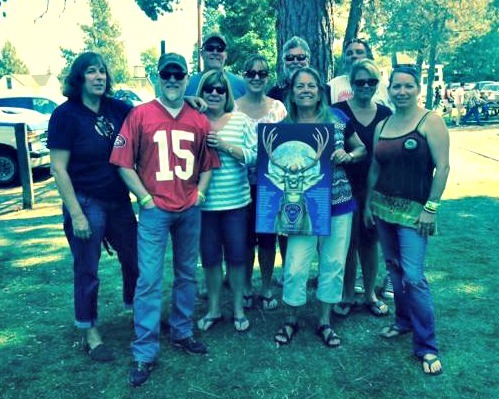 So, if beer is your thing then why haven’t you been to Bend yet?! Bendistillery ~ If you like the hard stuff now and then you should definitely check out this place. On our latest trip to Bend this past fall 2015 (which you can read here) we met up with one of the chemists for Bendistillery and got a private tasting at her house. The vodka was the best I’ve ever had. Go here. Stock up. Thank me later. There are so many things to do in Bend and the local area. It’s a playground for outdoor enthusiasts while offering all the comforts of a large city without losing it’s small town charm.